A few thoughts, nothing so earthshaking, on the performance of Éliane Radigue's music at Issue Project Room on October 20, with Laetitia Sonami, Carol Robinson and Rhodri Davies. "I do not renounce my electronic work, though I never accomplished anything that completely satisfied me. The end result was always a compromise between what I really wanted to do and what I was technically able to do using the means available. Conversely, with these musicians, I was finally able to hear, for the first time, the music I call my 'sound fantasies'." The three works presented ranged from electronic (with voice), to live electronic to acoustic and to some extent, not wanting to extrapolate too much from a single evening, bore witness to the accuracy of those remarks. The first piece was 'Mila's Song in the Rain', an extract from 'Songs of Milarepa', which was originally released in 1983. It's scored for electronics (Radigue) and voices: Tibetan reading and singing by Lama Kunga Rinpoche and Robert Ashley reading an English translation of the text (at the concert, this was simply played over the sound system, not performed live; I assume the same recording as on Side A of the Lovely Music release). Radigue's sounds, as is generally the case, were confined to a relatively narrow area but varied subtly and imaginatively within that band. Still, I found myself wondering if, over the course of its 19 minutes, it would have gripped my attention for the duration were it not for the spoken words. The Tibetan was, to my ears, inherently interesting both for its strangeness (to me) and the way it was half-spoken, half-sung, very beautifully. Ashley's text, on the other hand, delivered with his typical, wry, midwestern drawl, was amusing and, as Mimi Johnson mentioned in her opening remarks, satisfyingly grounded in the day-to-day. But the electronics, if listened to "separately" (not how the piece was designed, of course) seemed slightly limited, however attractive and well-deployed. Nothing major, but the thought arose. This was the first time I've seen Sonami play. I don't know the details of her instrument but clearly, her strokes, plucks and taps on the seemingly rather elastic strings, all but inaudible "acoustically", were greatly amplified by the connected devices, generating a gentle humming that fluctuated and lightly throbbed. Again, great subtlety and touch were in force and for a while, about 15 minutes, I was reasonably captivated. But...eventually it felt as though I had gleaned what there was to be gleaned, that I had heard the instrument's limitations (at least as used on this evening), that there were only so many plies to be penetrated. I don't think this impression had anything to do with Sonami's abilities, more a limitation of the instrument. Obviously, even if this is the case, other instruments might offer far greater depth but again, the thought nagged at me. 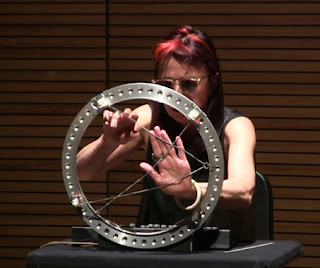 I've no idea how Radigue determines the approximate length of her work; this piece was about 30 minutes. Always an issue with music like this, here I thought it could stand some reduction. In the notes to 'occam ocean', Robinson states that its sound is "unstable" and it's delightfully so. I've no idea of its loudness potential, but played softly as was the case here, it has a wonderful, breathy, ghostly tone--think of, perhaps, a woodier sounding clarinet. While the piece was, as with most (if not all) of Radigue's in the OCCAM series, centered around one pitch, the vagaries of the acoustic practice, intentionally or otherwise, allowed for an enormous amount of variation. Perhaps it has to do with how much one's ears (my ears, in any case) can differentiate between pitches, timbres, etc., and it could also have to do with the specific instruments involved but whereas in the Sonami-played work, I thought the range exhausted after a certain point, with the harp and birbyné, I felt as though I could have listened for twice its 50-minute length and still not have begun to plumb its depths and complexities. The grain, the grain...it was like looking at a stone or piece of wood and always seeing more no matter how deeply you penetrated. While in Paris, I was fortunate to witness a performance of Radigue's 'Naldjorlak I, II and III', with Charles Curtis, Robinson and Bruno Martinez, one of the most powerful concerts I've ever experienced. Some of the effect was surely enhanced by virtue of sitting about six feet directly in front of the trio, especially Curtis. During the first section, in which he performed solo for about an hour, I was utterly absorbed into his instrument, thrown into an apparently infinite whirlpool of sound, with structures emerging and disappearing in seconds, an astonishing range of colors and more--all in the context of more or less a single, wooly pitch, a wolf tone as I was to learn, something I'm told cellists are trained early on to avoid. Here at Issue Project, if not to quite as strong a degree, something similar took hold, especially with regard to the variations each musician injected. Davies, "simply" drawing the bow(s) back and forth over one or two strings, between micro-alterations in pitch and fluctuations in dynamics, elicited a vast and clear soundscape within this ostensibly narrow constriction. Robinson, either due to the birbyné's inherent instability or her own intuition (both, I imagine), shifted the base pitch ever so slightly, but in context significantly and sometimes let a given series of phrases trail off in ghostly vapors, small, light filagrees of tone, immensely moving. 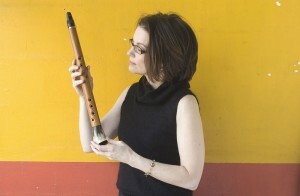 She would also vary the sound even more subtly by raising or lowering the instrument. Between the two sound sources, each remarkably complex in themselves, the listener has a virtual abundance of sonic riches in which to delve. To these ears, the rewards of Rdigue's music are substantially greater with the acoustic instruments than with the electronic ones, at least in my experience. I don't know that this would necessarily be the case, that sufficiently complex programming shouldn't allow for degrees of detail well beyond what human ears can distinguish, but something comes through Curtis' cello, Robinson's birbyné and Davies' harp, some level of aesthesia, that I haven't experienced in other forms. I should add that on first listen to the Shiiin release (which in addition to Robinson and Davies, features violist Julia Eckhardt), the above still holds true for me, even though when filtered via CD, an essential physicality is necessarily lost.